I love cooking at home. In my opinion, home food preparation with the freshest ingredients that the budget will allow is key to good health. But for me, it is also a way to express my creativity as well as my commitment to wellness. Most days, I find pleasure in going to my kitchen and creating a lovely healthy meal for my family, even after a long day at work. But lets face it. As a single mother of 3 kids, it just isn’t always feasible. So what do I do then? Sometimes when I don’t have time to cook or grab leftovers, I go out and make some poor choices with food. Lack of time means fast food wins at times. And that’s okay. Occasionally. That’s the life of a busy american family nowadays. We often get the kids off to school, zip to work, run from work to a school meeting, a sport practice, or to run errands. Time, for most of us, is our most precious commodity. Recently though, I made a decision to eat healthy even when I ate out. Actually, I wanted to see if it was possible, especially on my tight family budget. I am happy to report that it was challenging, but doable. Not only that, it was enjoyable, flavorful, and satisfying. What in the world do I mean? Let me explain. Have a breakfast meeting? No time to make a lunch to take to work? Is the family schedule and soccer practice making cooking at home impossible today? Well I have good news. A family can eat healthily at a restaurant. Last Friday night I met friends out for dinner. I ordered a hamburger and opted for sautéed veggies instead of french fries. And this was at a “sports bar” type of restaurant. I ate my hamburger without the bun with the veggies and it was delicious. True confessions…Yes, I had a beer too. But that is a good natural beverage, right? I mean, hops are all natural flowering plants after all. I am just saying…..
Back to the food! A few days ago I went to out breakfast with my daughter. I was able to have a fresh fruit cup with an egg white sandwich on whole grain bread. It was a well rounded breakfast that held my tummy till lunch. (Nothing bothers me more than my stomach “growling in the late morning!”). Upon seeing my order and how delicious it looked, she also ordered a low cal fresh fruit cup and a nutrient dense sandwich to go with her fruit. It is entirely possible to have healthy meals out and continue with a commitment to wellness! When you can’t make a good home made meal, what change can you make today to eat a little better when you go to a restaurant? Let me know! 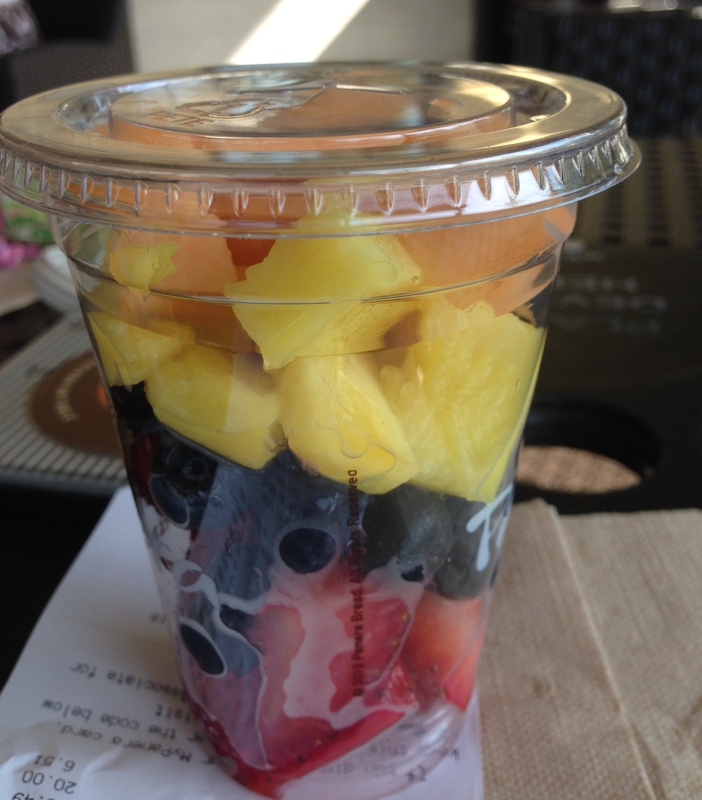 A fresh fruit cup from a restaurant. Eating out in a healthy manner!